The tour ended in Vilnius, Lithuania in 23.–27.5.2012. 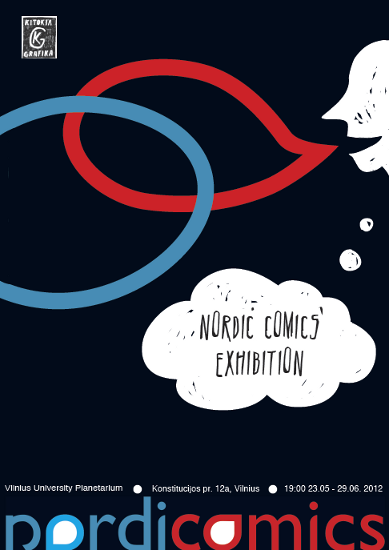 The Nordicomics exhibition opened afterwards at the gallery of Vilnius Planetarium 28.5.–29.6.2012. In the last workshop the participants created comics originals about Vilnius for a new touring exhibition, which opened first in Finland at Comics Center Helsinki 4.–30.6.2012. The participants in Vilnius were Egle Vitkute (LIT), Egle Shaltmira (LIT), Ingrida Picukane (LAT), Martins Zutis (LAT) and Maura Manninen (FIN). The Vilnius workshop and exhibition were a collaboration with Kitokia Grafika and funded by Nordic Culture Point.